When I surveyed the state of American-style barbecue in London, one of the most common queries was ‘what about Smokehouse?’. However, despite its name Smokehouse isn’t devoted purely to barbecue. This joint venture between Neil Rankin, former head chef at Pitt Cue, and the people behind the nearby Pig and Butcher, has a more varied menu but it’s still meat-focussed. Unlike other gastropubs which are restaurants in all but name, Smokehouse has a full bar and space for drinking – most notably the attractive and genteel beer garden decorated in fairy lights. The drinking space will shrink in winter though once the weather precludes outdoor drinking for all but the most hardy. The dining area is decorated in a spartan manner reminiscent of Pig and Butcher – there’s even a row of what I think are deer skulls along one wall. My first visit to Smokehouse was with Baron Greenback who is now back in my good books despite his crimes of cutting out the fat from pork belly and never having seen, or even heard of, The Thick of It. The evening didn’t begin well. 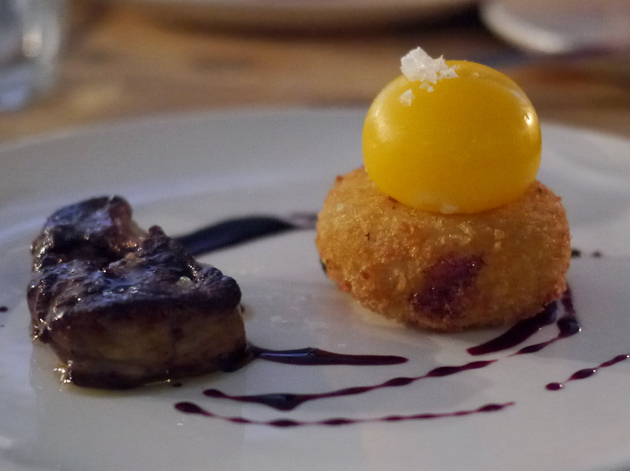 My starter of foie gras, duck egg and apple pie was misjudged and underwhelming. The almost-solid egg was muted, while the crisp, crumb coating of the ‘pie’ concealed the sharp taste of the apple filling. The jelly-like foie gras had a surprising offal-like quality to it. None of the drab elements came together as a coherent, cohesive whole which made for a disappointing start. This goose died for nothing. Baron Greenback’s choice of the simpler chopped brisket roll was far more successful. 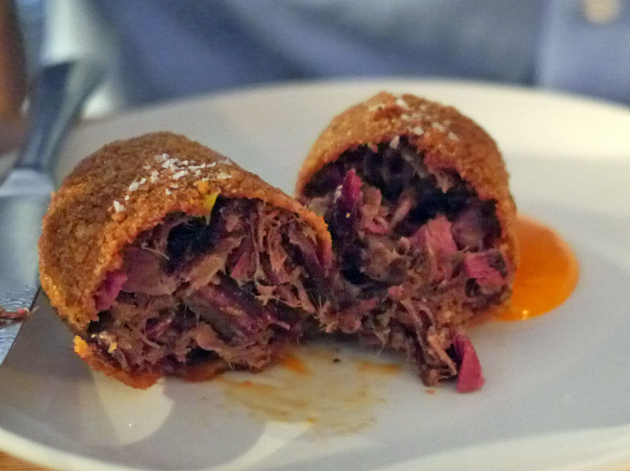 Although not quite as delectable as Texas Joe’s more traditional version, the chopped brisket here was still very moreish – tender, earthy and lightly smoky and encased in a crisp crumb coating. The meaty strands almost resembled a form of pulled beef rather than the small, chopped slices I was expecting, but it was of little consequence. 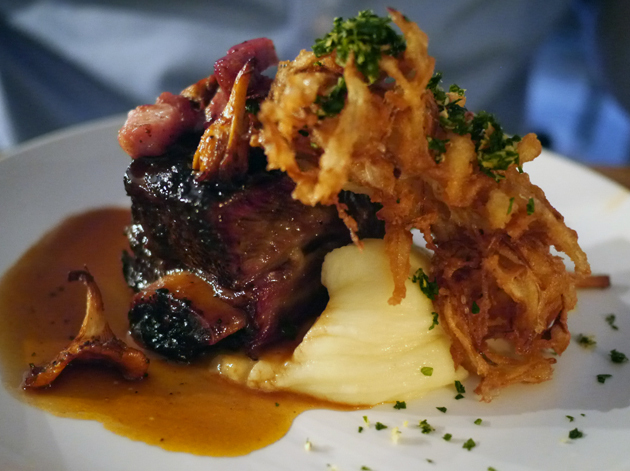 Beef bourguignon is a classic French dish where beef is braised in broth and red wine, so I was intrigued by Smokehouse’s short rib bourguignon. The tender rib meat, served on the bone of course, had a firm bite, a lightly charred bark and a tangy moreishness that was enhanced by the earthy mushrooms. Baron Greenback made the serious faux pas of discarding the mushrooms which puts him back in the doghouse. This fire is out of control. 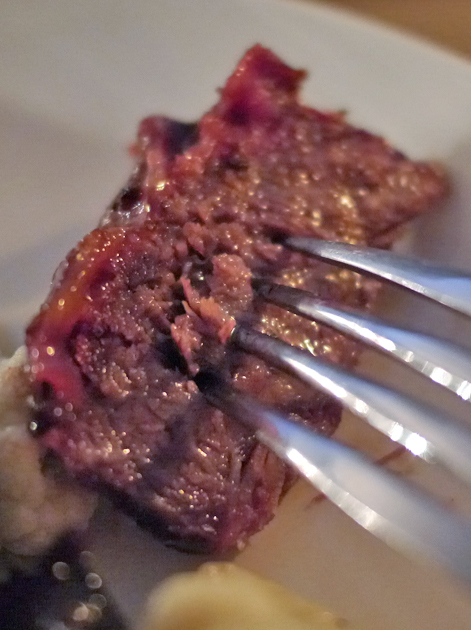 My own main course of peppered ox cheek with cauliflower and cheese was a triumph. 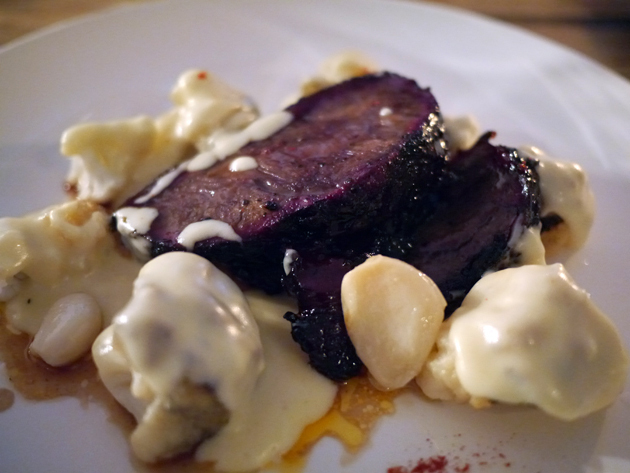 The exceedingly tender, unctuous meat was complimented very nicely by two differing versions of cauliflower – a bitter, tart, pickled variety and a charred, smoky version. The smooth, viscous dollops of thick cheese enhanced this warm, comforting dish even further. 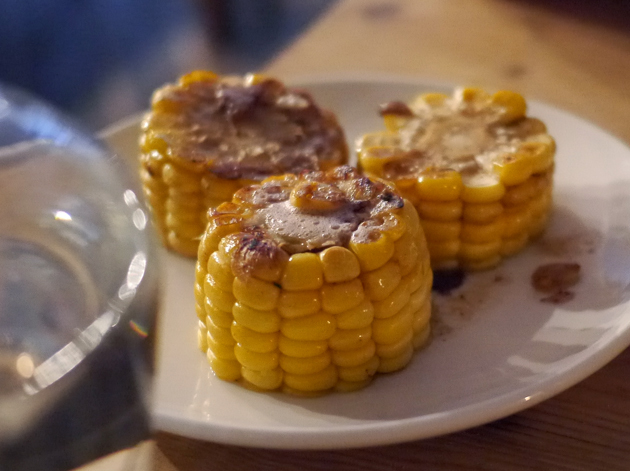 We shared a side of corn on the cob – the tender sliced cobettes had a smooth, slick, meaty, fatty sheen on them. 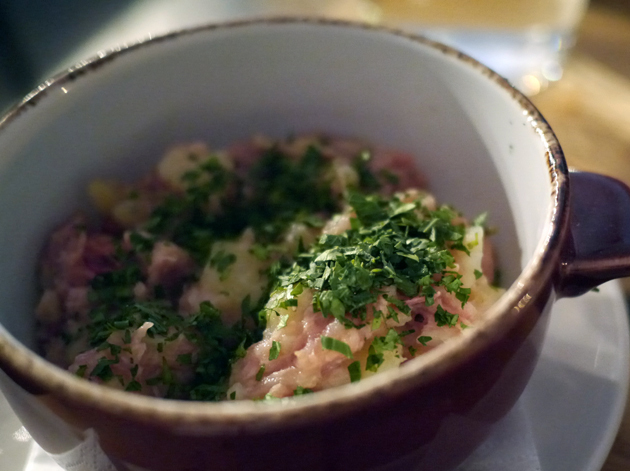 We also shared the lamb stovies, a roughly hash-like mixture of tender, just-cooked lamb and smooth, creamy mashed potatoes. Much, much better than a munchy box. For dessert Baron Greenback went for the oddly-named Friday Pie. 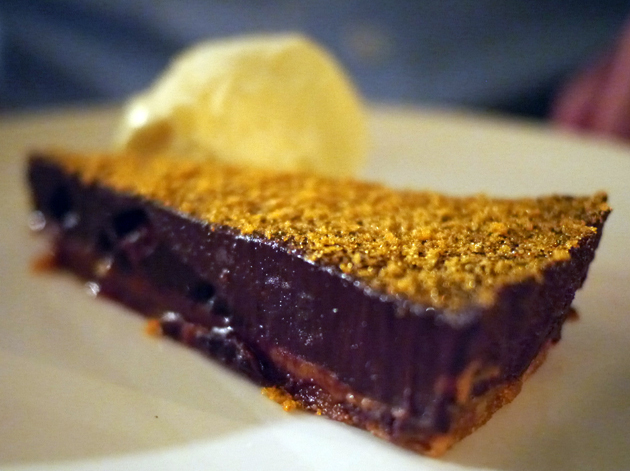 Although he enjoyed it, I found this combination of dark chocolate and honeycomb to be too chewy and bitter. Thursdays are the new Fridays. Except that doesn’t make any sense. My own dessert was far better. 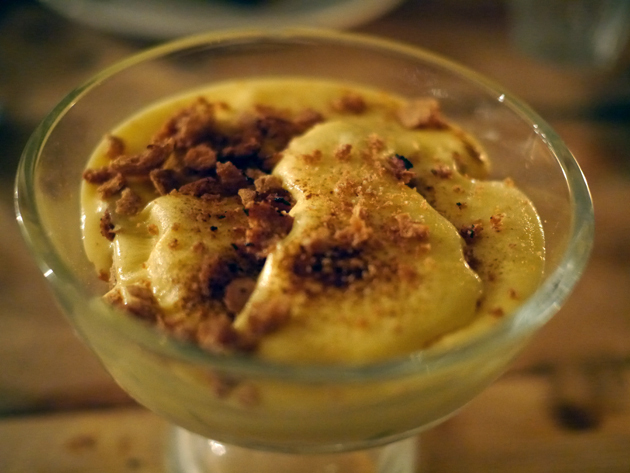 The zabaglione, an Italian custard of sorts, was light, creamy and more than a little boozy. It wasn’t a complete alky-fest though and was dotted with delicate, lightly sweet slices of white peach as well as a scattering of almond-flavoured biscuits. The combination of sweetness, creaminess and booziness was a highly effective one. I returned to Smokehouse for a second helping with the aid of The Euro Hedgie. 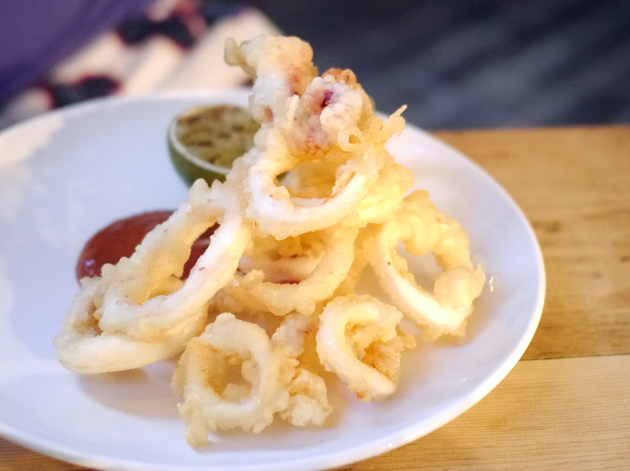 His starter of squid with romesco sauce caught him off guard – the squid arrived coated in a deep fried batter so it resembled a helping of cheap and nasty calamari. It was thankfully far better than that staple of bad Italian restaurants – firm, fresh squid was used rather than the usual defrosted, excessively soft rubber. 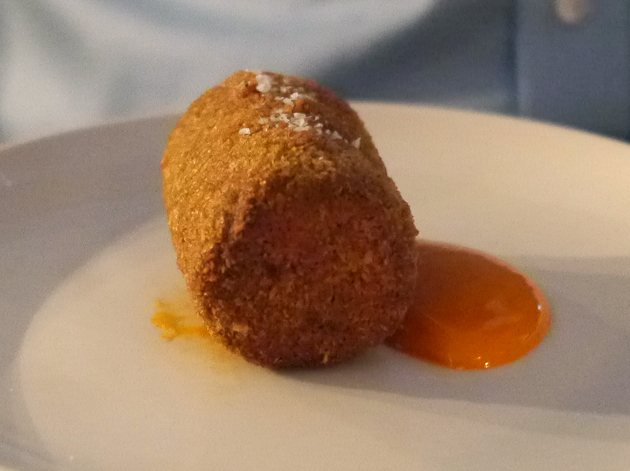 It proved to be a good way of shovelling the punchy, lightly spicy and earthy sauce into one’s gob. My own starter of smoked mullet with pickled clams went down a treat. 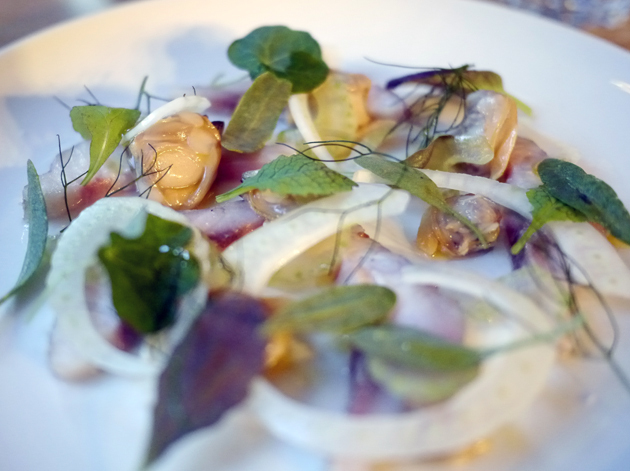 The vaguely sashimi-style slices of meaty fish were lightly smoky and complimented well by the dill-like flavour of the sea purslane and the tartness of the pickled clams. 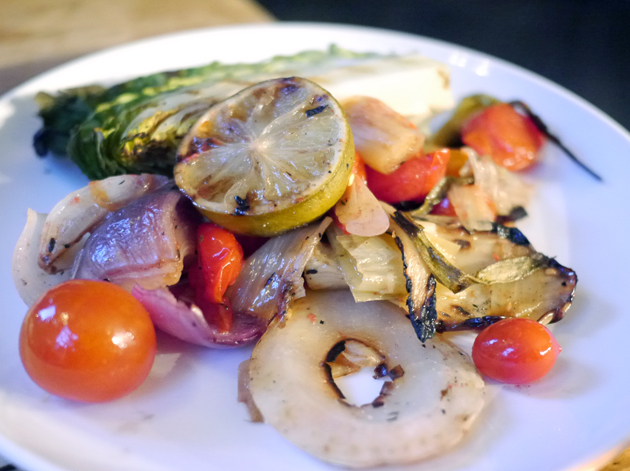 The clean aftertaste and refreshing lightness made it a great summertime dish. You can clearly see a pickled clam in this photo, but not a slice of mullet. Oh well. 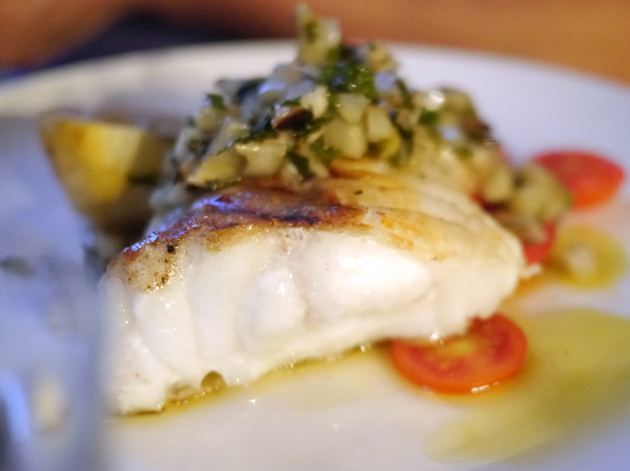 The Euro Hedgie continued the nautical theme with his main course of monkfish served with razor clams and tomatoes. Although he enjoyed the fish’s firm, bouncy texture, the seasoning tended to overpower its taste. The poor man’s lobster isn’t really that cheap anymore. The mutton chops unsurprisingly resembled lamb, but a little tougher. The meat was still reasonably tender and moist though, but most of the flavour come from the caponata, an aubgerine stew of sorts that was surprisingly thick, salty and fatty – presumably due to the addition of nduja and anchovies. Mutton chops. The good kind. The Hedgie and I shared the Smokehouse salad which, surprisingly, turned out to be one of the hits of the evening. The sweet, punchy and tangy tomatoes were reminiscent of the Thai-style tomato soups my parents insisted on cooking for me as a child, while the rest of the vegetables were charred, crisp and occasionally bitter. It’s a salad that will appeal to dedicated carnivores and perhaps even other steadfast salad dodgers. I was almost overwhelmed by the surprisingly strong booziness of the Vanilla Vanilla Vanilla. The booziness was due to the inclusion of Licor 43, a potent Spanish liqueur that’s made in part from vanilla. 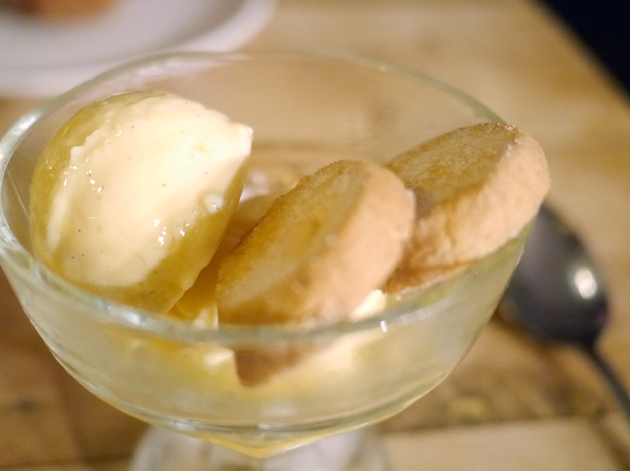 The other two vanillas were a crumbly flavoursome shortbread and a reasonably creamy ice cream. It’s a decent dessert, if you can cope with the boozy potency, but I had a distinct case of dessert envy as I gazed upon the Hedgie’s puddin’. 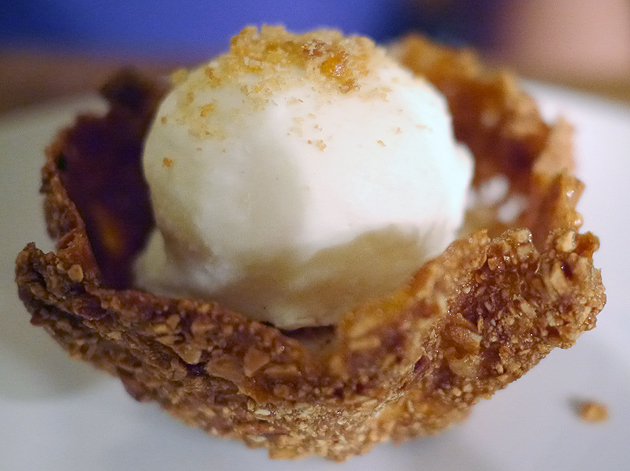 The Krun Chee Nut was effectively a bowl of Kellogg’s Crunchy Nut cornflakes in dessert form. A sweet, milky ice cream and a creme brulee-esque custard were served in a nutty, crunchy biscuit shell. It was easily the best dessert here. The trouble is they taste too good. 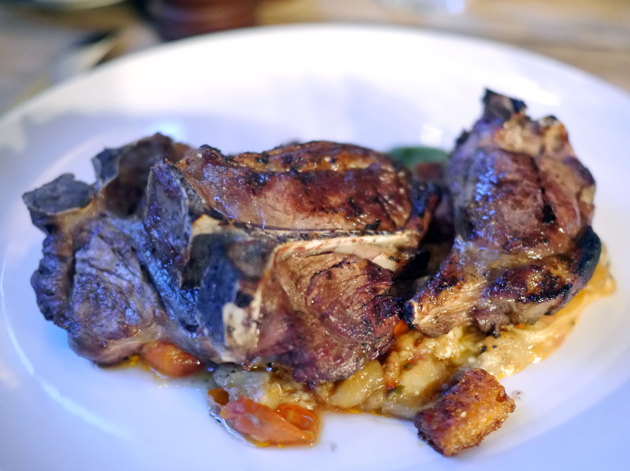 Islington has no shortage of gastropubs and while I ultimately enjoyed the homely, comforting grub of Pig and Butcher more, Smokehouse is still a fine place to fill your belly with well-cooked meat and fish. Although there were a few notable misses, I can only hope Neil Rankin sticks around long enough to not only overcome these problems but develop and hone the menu further as the seasons change. His previous tenures at Pitt Cue and John Salt have been surprisingly brief, but hopefully the meaty goodness of Smokehouse won’t be similarly short-lived. Kitchen Hours: Monday-Friday 18.00-22.00, Saturday 11.00-16.00 and 18.00-22.00. Sundays and Bank Holidays noon-21.00. Total cost for one person including soft drinks when shared between two: £36 approx. Tags: barbecue, bbq, beef brisket, clams, corn, duck egg, foie gras, lamb, london, monkfish, mullet, mutton, ox cheek, restaurant, review, salad, short rib, smokehouse, squid, vanilla, zabaglione. Bookmark the permalink. Great review.. will definitely check it out!